Summary: Over the past decade, content marketing, specifically in the form of online video, has become a fundamental tool for connecting with consumers. Native video, a more recent phenomenon that meshes in appearance—if not substance—with the overall feel of a publisher’s website, is achieving even greater viewer engagement. “Native advertising” has emerged as the convergence between original brand video content and dramatically new approaches to distribution that ensure an ad matches the look and feel of a website and does not interrupt the viewing experience in the manner of a television commercial. While the term “native” ads has not fully caught on with marketing executives, the core elements of native ad types are favored by them, which suggests this market will grow as awareness increases. For this study, Forbes Insights, in association with Sharethrough, a native video advertising platform company, surveyed 136 marketing executives. Forty-six were from companies with revenues between $500 million and $1 billion, and the rest were from companies with at least $1 billion in revenue. The vast majority (99%) were located in the U.S.
UK internet advertising spend is likely to reach £5bn in 2012, with Facebook on track for an estimated 84% revenue surge to £175m. Figures from the Internet Advertising Bureau (IAB) and PricewaterhouseCoopers reveal brands spent £4.8bn in 2011, up by £687m. The 14.4% leap marks the highest growth rate in five years. FMCG became the second-biggest-spending sector on display ads, at just 0.2% less than financial services, which has a 15% share of the total. Retail brands are now the third-biggest-spenders on display with a 12% share, having accounted for 10% of total display in the second half of 2010. The UK needs to see growth of just over 4% in 2012 – pretty much a certainty given historical levels – for the market to be worth £5bn annually. Strong growth in 2011 was partly due to an explosion in advertising on mobile devices and tablets, which rose 157% to £203m last year. Online video advertising doubled year on year to £109m as online TV services such such as the ITV Player and Channel 4’s 4oD increased in popularity. These two sectors have helped fuel the overall display advertising market – banners and interactive ads seen on most websites – to more than £1bn for the first time. Display advertising grew by 13.4% to £1.13bn in 2011. The IAB said that the display ad market has been pumped up by fast-moving consumer goods companies such as Unilever and Procter & Gamble finally latching onto the sector. The big FMCG companies are the biggest UK advertisers on traditional media, such as TV, press and radio, but have been slow to recognise the benefits of display ads. One of the biggest beneficiaries of the surge in display advertising is Facebook, which figures from Enders Analysis estimates doubled revenues in 2011 to just under £100m. This unofficial estimate – Facebook does not disclose its financial performance – is expected to surge by a further 84% this year to £175m. The stalwart of UK internet ad spend is search advertising. which is dominated by Google. 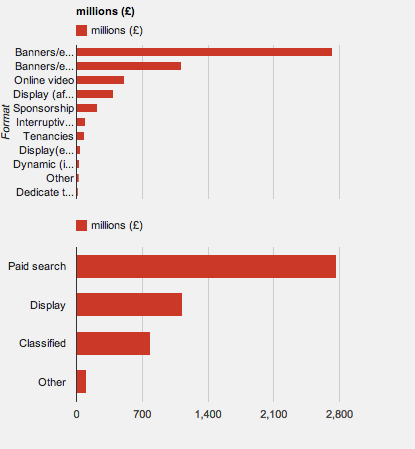 Search, which accounts for 58% of total UK digital ad spend, grew 17.5% in 2011 to £2.77bn. The growth has come from the British public’s love of web search and the cost-effective nature of search advertising.